Are you feeling like having something spicy? 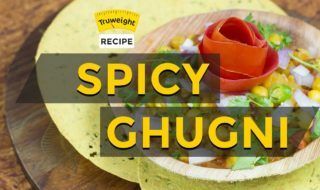 Here’s an easy recipe to enjoy a spicy bowl of Ghugni. It is a Bengali dish which can be prepared at home. Ghugni is prepared by cooking white peas with onions, tomatoes, and some chaat spices. The white pea provides the daily recommended amounts of vitamins and minerals like thiamine, folic acid, iron, copper, potassium, phosphorus, manganese, and magnesium. Ghugni is a kind of snack in Bengal, which you can find in every nook and corner of this state. It’s a very common yet delicious snack recipe and filled with bountiful of nutrients. Try the yummy recipe today! Take oil and add ginger garlic paste and onion. Saute them well. Add tomato to it and mix thoroughly. Add some salt, chilli powder, garam masala and turmeric powder. Saute them. Now add soaked and cooked yellow peas. Add the required amount of water. Enjoy your spicy and tasty ghugni bowl.